HFG2 (G247.5-04.7) was discovered by Heckathorn, Fesen and Gull in 1983. It is located in the southern constellation of Puppis about 6,000 light years distant (D. Frew, Ph.D. thesis, 2008). This planetary nebula (PN) is elliptical in shape with “pitted” structure approximately 3 x 2.5′. The bright region to its lower right is part of the interstellar medium (ISM) that the PN is interacting with. There is a band of H-a emission appearing diagonally across the image. There is a larger OIII-enriched halo structure extending above and to the left of HFG2. Its origin is unclear, and I could not find any reference to it in the literature. 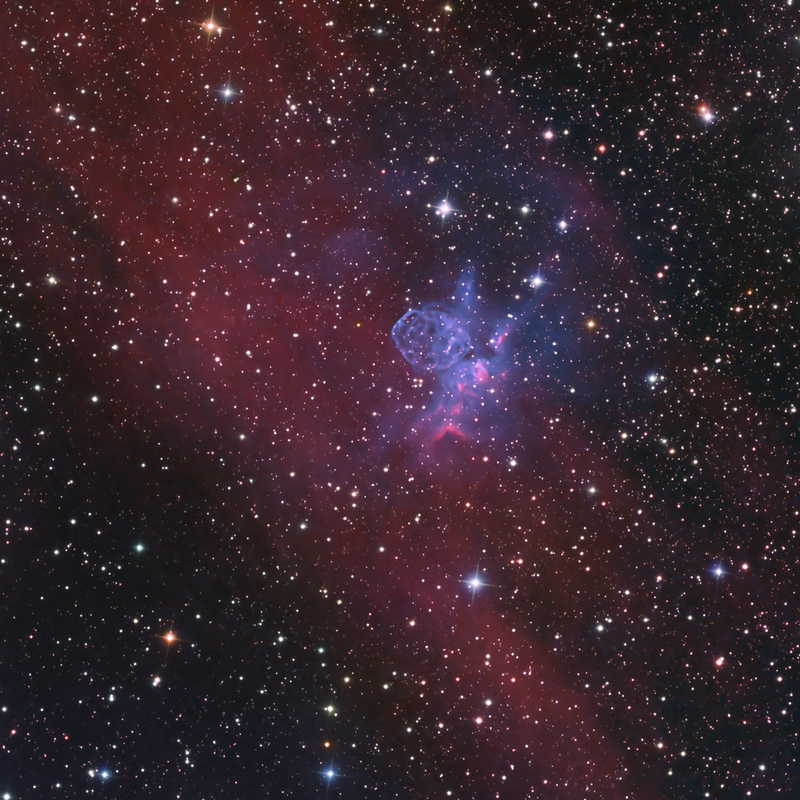 Overall, the combination of PN and ISM emissions resembles Thor’s Helmet (https://astrodonimaging.com/gallery/thors-helmet-in-h-a-oiii-rgb/), NGC 2359, which is a Wolf-Rayet bubble in Canis Major. This may be the first color image of HFG2. Unusual and indeed an extremely beautiful object, masterfully processed. Impressive image, Don, congratulations! I like this “brainy” structure, it really resembles the Thor’s Helmet. Thanks, Josep. You should image Thor’s Helmet with your northern hemisphere system and compare! This is amazing! Puppis is full of strange unusual nebulae and you do them well. Background nebulosity is always an added bonus. I hope you image many more unphotographed southern PN!